Back in 2014 I was working at a language school in Manchester, teaching English to students from all over the world. At the start of the year we had lots of Venezuelans enrolled, many of them teenagers away from home for the first time and having the time of their lives. As the year progressed, their moods notably changed as the situation at home worsened, and many of them returned home not knowing what state their country would even be in. By 2015, there were only a handful of Venezuelans left – the ones lucky enough to hold a European passport thanks to one of their family members. Nobody else could get a visa any more. It’s hard to believe they have been stuck in the same situation for so many years now. I wonder what the future holds for those bright, enthusiastic teenagers who spoke of their country with such pride. In mixed nationality classes, it was always fun to get people talking about their national dishes. I remember one Venezuelan girl being absolutely outraged that nobody in the class had heard of arepas, which she genuinely believed should be as famous as pizza. She would be pleased to hear that I finally tried arepas for myself in 2017. 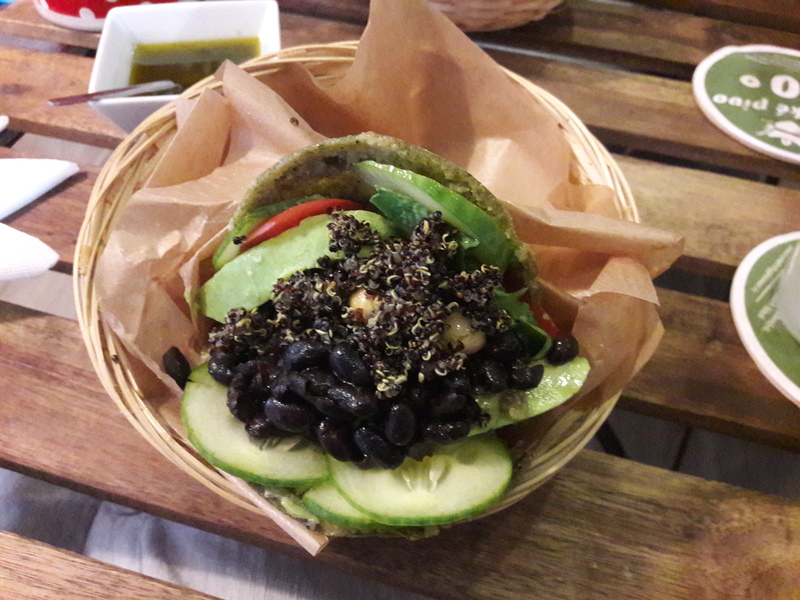 I’d walked past Arepas de Lyna many times before I spotted the words “vegan arepas” in one of their Facebook posts, and then I was there! For the uninitiated, arepas is a kind of corn pancake stuffed with various good things. Nothing on the menu here is explicitly labelled vegan, but the staff know what it means and served me the vegetarian arepas without the cheese. 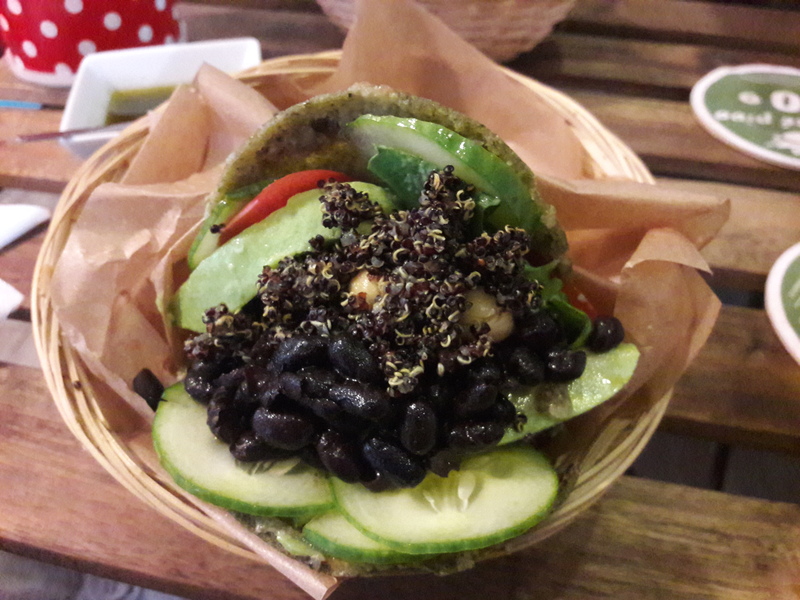 It was stuffed with quinoa, black beans, chickpeas, cucumber and avo, and served with a pot of spicy sauce on the side. It was tricky to eat (we used a lot of napkins! ), but worth the effort – it was really good! It’s a lovely place to while away some time too – lively music, friendly staff (presumably Venezuelans), and happy customers spilling onto the pavements in the summer. The food was a little steep (120czk for one, and you’ll definitely want more than one unless you’re just grabbing a light lunch), but everything was fresh and delicious. 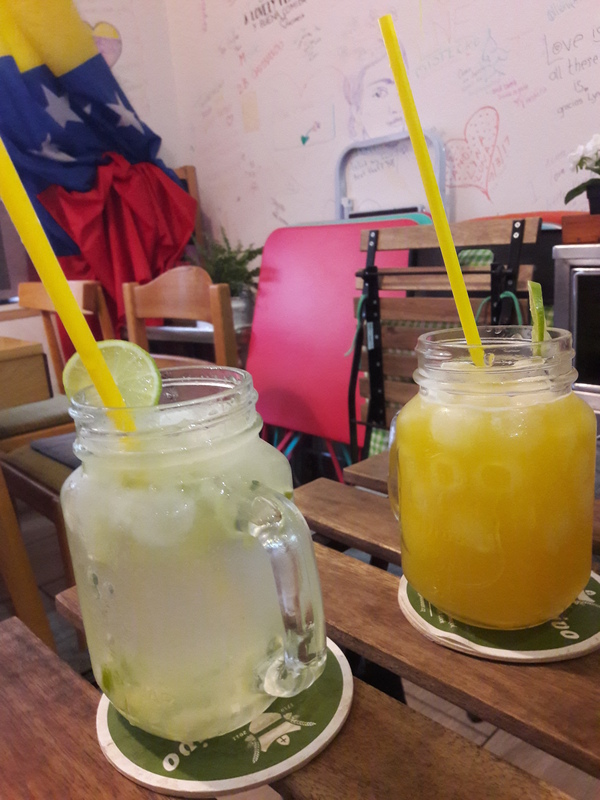 The homemade lemonades are really good too – I had the classic citrus one, and Dr HH went for passionfruit. All in all, a great introduction to Venezuelan cuisine! Have you tried arepas before? What other Venezuelan dishes are out there? 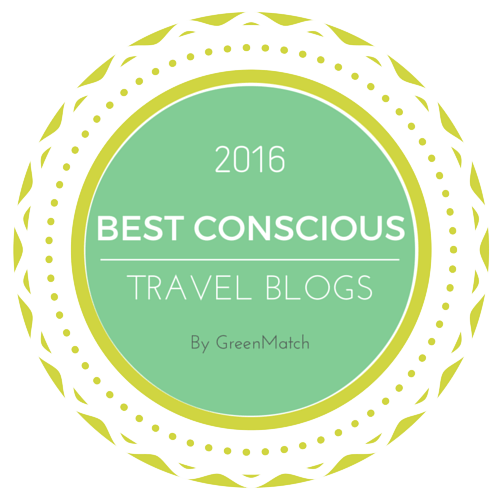 This entry was posted in Travel, Vegan Mofo and tagged Arepas de Lyna Prague, vegan arepas, vegan Prague, vegan travel, veganmofo18. Bookmark the permalink. I LOVE vegan Arepas. Those look pretty good. I’d like to see what other vegan fillings there are out there. Something cheesy would have been amazing! Ugh, nobody has time for that specific a recipe, surely!